See photos from last year’s Bauer Pride Day. This week, the C. T. Bauer College of Business at the University of Houston will commemorate what would be the 100th birthday of the college’s benefactor, Charles T. “Ted” Bauer’s, with the annual Bauer Pride Day on March 6. This year, Bauer Pride Day, which has become a college tradition, will focus on celebrating the occasion and all of the achievements of Bauer students, faculty, staff and alumni. During the event, attendees will have the opportunity to play games and win prizes during a resource fair in Melcher Hall’s AIM Ticker Lobby from 2 p.m. to 5:30 p.m., followed by a presentation from George on the state of the college at 5:30 p.m. in Melcher Hall 160. 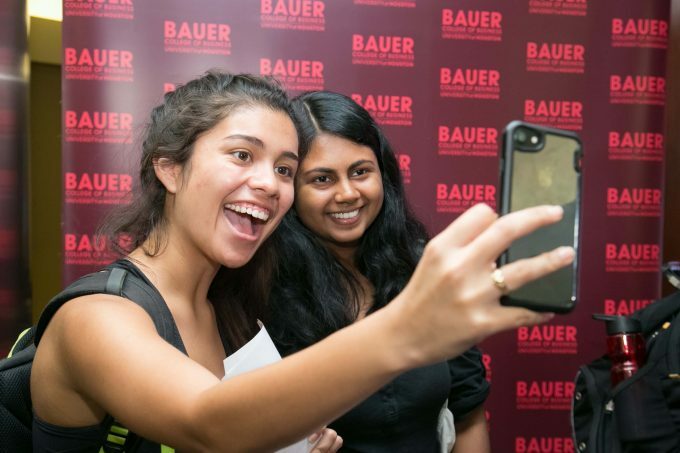 “Bauer Pride Day is designed to educate students about Ted Bauer’s legacy, deepen the students pride for their college and provide an opportunity for students to engage with the college and university resources in a fun and informal way,” Program Manager for Student Engagement Tierra Walters added. “The generosity of Mr. Bauer continues through his foundation. The C. T. Bauer Foundation has provided $7,650,000 over the last five years to fund two-year, full-tuition-paid scholarships for outstanding Bauer College students with financial need, awarded to 215 students so far with 65 more scholarships to be awarded this Fall 2019 —one of the most generous scholarship donations in the country, and one that has impacted the academic and career success of so many deserving business students who require financial support for a timely graduation,” Undergraduate Business Programs Associate Dean Frank Kelley said. For more information about Bauer Pride Day, click here.